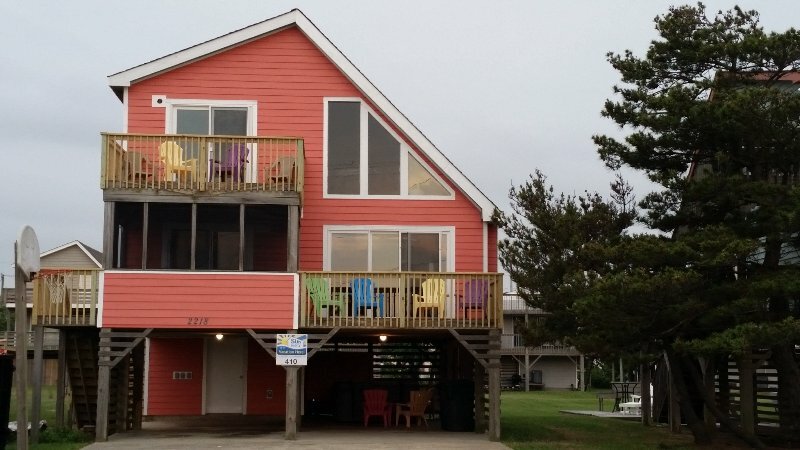 Seahorse is the perfect beach house for your OBX Vacation!! Seahorse is located on the beach road in Nags Head, right across from the beach. Beach access is a 2 minute walk. Seahorse is a 3 bedroom with a loft, 2 bath beach house, with ocean views from the upstairs master bedroom deck, and the upstairs loft area. Seahorse is well maintained, clean, and is nicely decorated in colorful beach decor, new carpet, etc. Kitchen is well stocked. Seahorse has just undergone major exterior upgrades and updates. Including New Colorful Siding...Caribbean Coral! New windows through out house, New sliding glass doors, New decks and railing..front and back, etc. New larger Jacuzzi with private sitting area!!! The loft area has a fouton, game table, tv/xbox, karaoke, games, books. and is the perfect space for the kids to hang out. The upstairs queen master bedroom has a private deck, great for viewing the ocean, enjoying the sunrise, just watching the day go by, or stargazing at night. Also upstairs is the bunk bedroom with 2 sets of bunks. The first floor has a double bed bedroom, full bathroom, screened porch, and a sun deck. The family room has a flat screen tv with Dish Network, blu ray player, wireless internet, stereo/cd. Enjoy relaxing on the large deck over looking the private back yard. The jacuzzi is next to the outdoor shower, with a private sitting area. Relax while grilling dinner on the park grill or shoot a few hoops in the basketball goal, don't forget your basketball. Plenty of parking, including spaces under the house. Store all your beach needs and fishing gear in the inside storage room which includes the laundry area. Nearby is the enclosed hot/cold outdoor shower with dressing area. Amenties include: New Hot tub, basketball goal, x-box, screened porch, sun deck, 2 levels, large back sun deck, outdoor heated shower, Tvs, dvd, blu ray, Dish Network, MW,DW, W/D, deck furniture, ocean views, park grill, stereo/cd, central H/A, Wireless Internet, Net flix, books & games. So book Seahorse NOW...for a fabulous get away at the beach! We will do whatever we can to assist you in securing a rental. The area of Nags Head is close to shopping, restaurants, mini golf, movies, art galleries, etc. INQUIRE NOW FOR DISCOUNTS FOR MAY AND JULY 2017!!!! Always happy to assist with your OBX vacation, everything from questions regarding the home, to activities to do while on vacation, to resolving any issues that may arise at any point. Much pride and care has gone into Seahorse to make it the best OBX vacation ever~~ Ease of booking, payment, contract, and getting set up once there. Any questions or concerns along the way are welcomed and resolved immediately. OBX is relaxing and beautiful! I love the sunrises and sunsets... I enjoy managing the OBX beach homes including cleaning/updating/ decorating, so my guests have the best vacations. I love the islands, boating, and traveling I am also a travel specialist and cruise specialist...love to cruise!